How much players receive from major championships has been a source of strife – especially for those who are not superstars. Perhaps it is because the Australian Open is the first Grand Slam event of the year but the event does seem to be the focus of player unrest. Tennis authorities in Australia are doing their bit to help ensure there is no strike by tennis players over the issue of prize money. How much players receive from the major championships in the game’s calendar has been an increasing source of strife in recent years with the stars feeling that they do not receive an appropriate share of the tournament’s revenue. 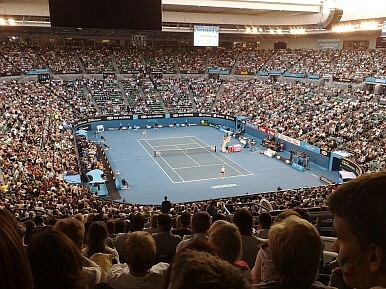 The idea of a strike was first mooted ahead of the 2012 Australian Open last January, though opinions differ as to how serious the threat was. “When we went through the player meeting at the Aussie Open, it was pretty brutal,'' US Open champions Andy Murray said in May. Then there was a split between Nadal and Murray on one side, vocal in their desire for a better deal for the players, and Roger Federer on the other. The Swiss star stayed neutral and Nadal, nicknamed ‘Red Rafa’, was reportedly angry that Federer did not speak out on the issue. Murray has been a vocal campaigner for a greater percentage of prize money filtering through the players, especially those at the lower end but said this week that a strike was never on the cards. ''You know, from my side, I never viewed striking at the Australian Open as a real option,” he said and added that the announcement this week of more prize money is welcome. Australian tennis officials held recent meetings with the players and gave them more money. The total purse on offer for 2013 is now AUS$30 million (US $31 million) – a rise of AUS$4 million from 2012, itself a record figure. It sounds strange to hear of multi-millionaire athletes talk of strike but what is at issue is the pay of lower-ranked players, who often exit in the first round after making the long journey Down Under. In the past, an early defeat meant not much more than AUS$20,000 and for those without significant sponsorship, it is not going to be a lucrative trip. While it remains to be seen how the increase in prize money is allocated to the players, those at the lower end of the scale should be better looked after. Tennis Australia chief executive Steve Wood met with the ATP (Association of Tennis Professionals) at the recent Shanghai Masters. "We have talked about our long-term plans for player compensation, including further significant increases and the feedback we have received from the ATP and the players has been positive." For the lower-ranked players –often without significant sponsorship – the costs involved in the trip to Melbourne leave a big hole in the US$21,000 or money they receive. "Our intention has always been to make a major contribution toward improving the compensation of professional tennis players to make their profession more viable throughout their ranks. The attitude of the players has been very pleasing." U.S. Open tennis champion Sam Stosur admits that the pressure told at home in the Australian Open.